When were the monasteries destroyed in Tibet? I have to confess that I am not much familiar with the history of Tibet/China and that I am in a learning process. My interest mainly comes from a sense of justice I have for Tibetans and their sad situation. 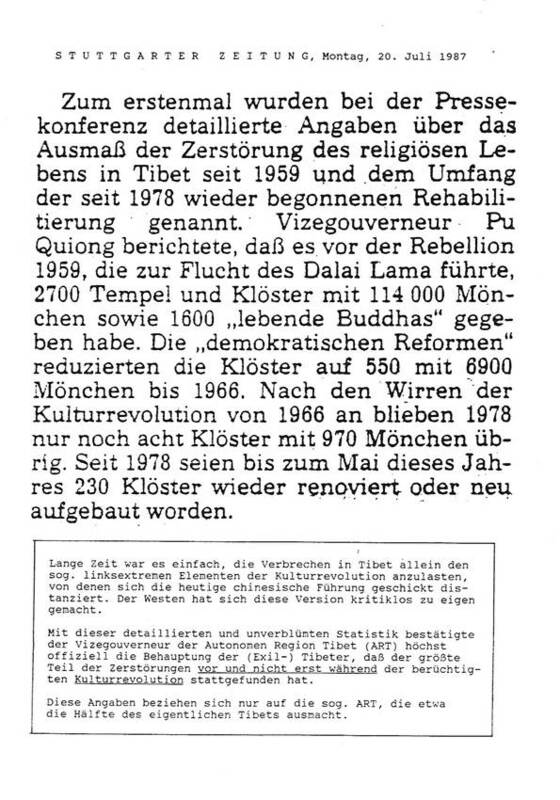 Recently during a discussion of members of an adult education center in Germany one man said, that it were the Red Guards during the Cultural Revolution (1966–1976) who destroyed the monasteries in Tibet. But one Tibetologist who was present corrected him and said that most of the monasteries were already destroyed before the Cultural Revolution. However, the adult education center member didn’t believe the Tibetologist and after a check in all for him available history books, travel books and the internet he came to the conclusion that it were the Red Guards who destroyed the monasteries in Tibet. He concluded – based on his research and own experiences in Tibet in the 90ies* – that there might not be any authentic source that can approve the claim by the Tibetologist that most of the monasteries were destroyed already before the Cultural Revolution. This analysis by David Kay with respect to the history of a New Religious Movement, the NKT, might be well applicable also for this case. What are the facts and the sources which approve the Tibetologist’s point of view and disapprove the adult education center member’s point of view? For a long time it was easy to blame for the crimes in Tibet alone the so-called left-wing elements of the Cultural Revolution, of which the present Chinese leadership distances itself. The West has made this version uncritically their own. With this detailed and blunt statistics the Vice Governor of the Autonomous Region of Tibet (ART) officially confirmed the contention of the Tibetans (in exile) that most of the destruction took place before rather than during the infamous Cultural Revolution. These figures relate only to the so-called ART, which accounts for about half of the actual Tibet. (1) Before democratic reform there were more than 2,500 large, medium and small monasteries in Tibet. After democratic reform, only 70 or so monasteries were kept in existence by the government. This was a reduction of more than 97%. Because there were no people living in most of the monasteries, there was no-one to look after their Great Prayer Halls [da jing tang] and other divine halls and the monks’ housing. 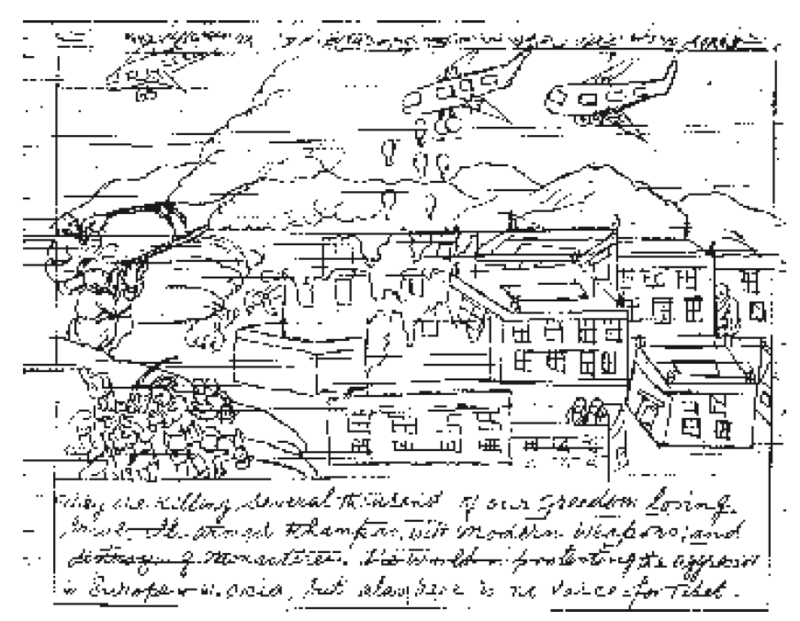 There was great damage and destruction, both by man and otherwise, and they were reduced to the condition of having collapsed or being on the point of collapse. (2) In the whole of Tibet in the past there was a total of about 110.000 monks and nuns. Of those, possibly 10.000 fled abroad, leaving about 100,000. After democratic reform was concluded, the number of monks and nuns living in the monasteries was about 7.000 people, which is a reduction of 93%. n. 8 Jing Sun, “Socioeconomic Changes and Riots in Lhasa” (unpublished paper), 1990,1 citing Zjang Tianlu, Population Change in Tibet (Beijing Tibetan Studies Publishing House of China, 1989), 28. These figures refute the common Chinese contention that the destruction of Tibetan Religion took place during the Cultural Revolution and was exclusively the fault of the “gang of four”. Only the physical destruction took place during the Cultural Revolution. n. 64 Ch’ing Jun : “Socioeconomic Changes and Riots in Lhasa.” Must be the same as in n. 8, only author’s name written differently. The official Chinese explanation is that all religious objects and monuments were destroyed during the Cultural Revolution and by the Tibetan people. From their own enquiries and interviews with hundreds of people all over Tibet, the delegation formed the following picture of what had actually happened. Most monasteries were destroyed between 1959 and 1961. The larger, more famous ones remained until the Cultural Revolution in 1967, when they too were destroyed. The destruction of monasteries and religious objects was carried out systematically. First of all, special teams of mineralogists were sent to religious buildings to find and extract all the precious stones. Next, experts on metal arrived and marked all metal objects which were subsequently removed. Then, trucks were sent from local commune headquarters, the walls were dynamited, and all wooden beams and pillars were taken away. Clay images were destroyed in the hope of finding precious objects inside them. Finally whatever remained—bits of wood and stone—were removed by the local people. Sometimes the main temple was used for storage, in which cases, the paintings on the walls would be rubbed out—or at least their eyes—whitewashed, or covered with human excrement. * He was professionally and without minders in Tibet for a German institution in the 90s and had asked himself the Tibetan monks, when the monasteries were destroyed. The Tibetan monks answered that the monasteries were destroyed by the Red Guards during the Cultural Revolution. This might demonstrate the effectiveness of the re-education and propaganda in Tibet that China (even by force) imposes on Tibetans and their own people. ** The newspaper quotes Vice Governor Pu Quiong from the official Chinese press conference conducted in Lhasa that was part of the visit of Germany’s chancellor Helmut Kohl to Tibet in July 1987. The press conference was held in Chinese language and the Chinese authorities offered an official translation into German. The tapes of this press conference still exist. I had the opportunity to travel quite extensively in different areas of Tibet after the opening (1985), and I quite systematically asked this question (not only monasteries, whole villages also disappeared), elder monks were keen to tell the actual facts. Cultural Revolution saw a systemic approach to demolition (Tibet was not an exception,all of China suffered from this madness), but often the buildings were already damaged or emptied anyway. Reblogged this on A Traveler's Thoughts.